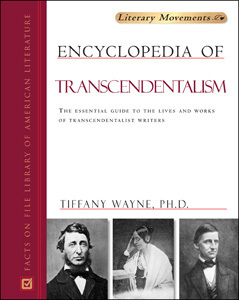 Authored by: Tiffany Wayne, Ph.D.
Encyclopedia of Transcendentalism provides a comprehensive A-to-Z guide to the Transcendentalists, the legendary group of New England authors that included Ralph Emerson and Henry David Thoreau. Transcendentalism promoted intuitive knowledge and the idea that the individual, rather than the Christian God, was the spiritual and moral center of the universe; it was often called the most influential American literary and intellectual movement of the 19th century. Entries cover writers, literary works, and more, ranging from the movement's origins in the first decades of the 19th century to the activities of a second generation of thinkers and activists after the Civil War. This volume is unique in bringing together all of the major, as well as some lesser-known but significant, writings of a wider circle of writers and thinkers associated with the Transcendentalists and engaging their philosophical themes. Major transcendentalist essays and lectures, including Emerson's "Self-Reliance" and Thoreau's "Civil Disobedience"
Major poems, including Emerson's "Concord Hymn" and Walt Whitman's "Song of Myself"
Major works of short fiction, including Hawthorne's "Rappaccini's Daughter" and Louisa May Alcott's "Transcendental Wild Oats"
"...a readable, well-organized, accurate reference work that should be a first choice for use in public, academic, or secondary school libraries..."
"Recommended for undergraduate and large public libraries." "Wayne's mastery of the material shows throughout; she has clearly given deep thought to the subject and done a great deal of research. Her reference work...should be in all libraries."